1956 Diploma in Sculpture and Modelling, Govt. College of Arts and Crafts, Calcutta. 1968 Exhb. organised by West Bengal Academy of Dance, Drama, Music and Fine Arts, Calcutta. 1968,73 Exhb., Rabindra Bharati University, Calcutta. 1969 Exhb., Birla Academy of Art and Craft, Calcutta. 1973 Group Exhb., USIS Auditorium, Calcutta. 1975 Annual Exhb., Birla Academy of Art and Craft, Calcutta. 1976 All India Sculpture Exhb., Sculptor Forum of India, Gunthur. Exhb. by West Bengal State Academy of Dance, Drama, Music and Fine Arts, Calcutta. 1978 Traveling exhb., Lalit Kala Akademi, New Delhi. 1979 Exhb. by `Calcutta Painters`, New Delhi. 1981 Homage to Picasso by `Calcutta Painters`, Calcutta. 1986 Trends in Bengal Art, organised jointly by Commonwealth Institute, London and Crafts Council of West Bengal, at Commonwealth Institute Hall, London. 1997 Annual Exhb., Birla Academy of Art and Culture, Calcutta. 25th Contemporary Indian Artists, Birla Academy of Art and Culture, Calcutta. Kolkata.Roopankar Museum of Fine Arts, Bharat Bhavan, Bhopal. Deptt. of Culture, Govt. of West Bengal, Kolkata. 1959-61 Govt. 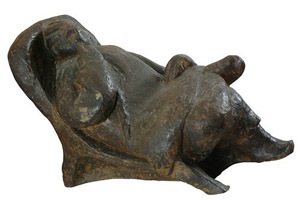 of Yugoslavia, for higher studies in Sculpture and Bronze casting, awarded him a Scholarship. 1988 He was appointed one of the member by the Govt. of Madhya Pradesh for selection of an artist for the `Kalidas Samman` award. 1991 His interview was telecasted by the Calcutta Doordarshan, Calcutta. 1994 Awarded Asian Paints 12th Shiromoni Puraskar, Calcutta. Bepin Behari Goswami is a very significant sculptor, because he has established a remarkable self-identity. His artistic aptitude excelled in portraiture and human figures. 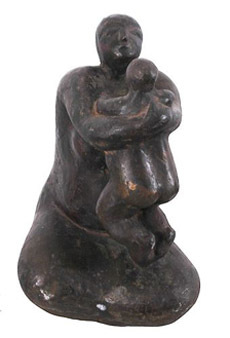 1958-59 Lecturer in Sculptor and Head of the Sculpture Deptt., Indian College of Arts, Calcutta. 1962-64 Came back from abroad and joined again the Sculpture Deptt. of the Indian College of Art and Draftsmanship, Calcutta. 1964-69 Worked as Principal of the Indian College of Art and Draftsmanship, Calcutta. 1986-99 Taught as Reader in the Deptt. of Sculpture, Kala Bhavan, Santiniketan. 1990 He was appointed as a Visiting Fellow of the Deptt. of Plastic Art, Faculty of Visual Art, Benaras Hindu University, Benaras.